The Argument: (RFYL) I believe I run in order to become a better person. There is growing evidence that runners and other endurance athletes share my belief. A close observation of running clubs just here in the valley (Greater Phoenix) reveals commitment to worthy causes of all stripes. Many clubs and athletes personally help raise funds for humanitarian charities. Most races from 5K’s to Ironman’s to Ultra’s fund major charitable organizations. On the individual level just belonging to a club implies that we make sacrifices of time and energy in order to support our teammates. Anybody who has run for a while has offered some assistance to a fellow runner. Given advice, shared water, offered a hand up. Just being available for a partner run makes both you and the partner better. The Question: Has the naturally competitive nature of running began to fade in favor of the desire to make a contribution to ones fellow man? How (I) RFYL got involved: Victoria Murphy, a friend from my running team Run 4 It Endurance Training, decided to “take the Mudder on”. I (RFYL) was intrigued by Victoria’s description of the event so I googled it up. I was blown away by the audacity of its demands for courage and stamina. That’s when I decided to pledge my support to my teammate by cheering her through as many obstacles as I could reach. Victoria’s reaction to my pledge was so genuine and so gracious, I immediately felt very good about myself. The euphoria was short-lived, however, because I turned out to be about as useful as a good intention on the proverbial road to hell. My major mistake resulted in not making adequate preparations for the fact that the Mudder Event was staged on the Mesa Proving Grounds which is at least a three crow drive from my home in N.E. Phoenix. Yet with all my procrastination, I had only two blocks to go on Elliot, a major artery in that part of the valley, in order to make Victoria ‘s 9:45 start time with time enough to spare to give her a big hug as send-off for her Mudder ordeal. As I exited the highway onto Elliot, my heart nearly stopped. My two blocks were a virtual parking lot. I eased into gridlock and sat there for a half hour. Victoria took off at 9:45 am. I was just checking in at 10:00. Strike One. Once on the Mudder grounds, I figured I had time to wander around and check out the obstacles before I settled on one where I could catch Victoria and cheer her through. The names of the obstacles were nearly as blood curdling as the obstacles themselves–Arctic Enema, Berlin Wall. Finally, approx two hours after Victoria’s start, I settled on an electrical shock therapy. This little beauty required the runners to crawl through a bed of water and mud while at the same time avoiding the electroshock tentacles dangling inches above them. As soon as I saw it I hit on a plan to redeem myself for missing the pre-race hug. I would stand at the far end of the mud field and as Victoria arose from the sludge I would step up and give her a full body hug, thereby absolving my guilt in a glorious mud bath. Over the next hour and a half I watched hundreds, I don’t know, maybe thousands of brave souls go through the mud. No Victoria. Strike Two. I decided to bag it and head for the finish line. There I witnessed a moving mass of humanity being funneled through the Finish Arch into the finishing area that offered race mementos, free beer and photo ops. I parked myself at the narrow gap through which all finishers had to ultimately pass to get to their friends and family on the outside. At such close range I couldn’t possibly miss Victoria again. But after another eternity of looking into muddy, bloody faces I checked my watch for the final time. I had been on the course five hours from Victoria’s start time. I had missed her again. Strike Three! When I saw her sitting on the waiting bench she looked much smaller than I remembered. Her eyes appeared as two tight lines etched onto a childlike face. We hugged, Victoria told me she had finished and had not been able to see out of the mud eye since around mile ten. She thanked me for coming, introduced me to her friend and the three of us began to make our way back to our cars. I was not able to accompany them very far because, as the two of them headed into the sea of cars, I realized that I didn’t know where they were going or where my car was parked. I had forgotten to count my rows. Is there such thing as a strike four? From the troops on the ground: Three bold spirits offer their take on the mind and body numbing challenges they overcame and weigh in on the question, has service to comrades surpassed winning as the major prize? I work for Fry’s Food stores, in Loss Prevention. I am married, my husband is a police officer for Phoenix. I have 3 step kids/teenagers. Twin 16 year old girls and a 19 year old boy who will be FINALLY going to AF boot camp the end of April. I went to Greenway High here in Phoenix. I was born Las Vegas, and lived Utah before moving to AZ in the early 80’s. Love Wisconsin sports (Go Pack Go! ), running, hiking, heavy metal, movies, and a good craft beer. Life is short, so do whatcha wanna. RFYL: Victoria Murphy is my instigator. I might say to her what Ollie said to Stan, “Here’s another fine mess you’ve gotten me into.” (Laurel and Hardy). As her history of volunteerism suggests, she’s always startin’ somethin’. RFYL: Sharon Campbell is our underdog long shot. When I and my Run For It Endurance Training teammates met Sharon at the Veterans Day 11K she thought the race was long and hard. She is now planning to run the IMS Marathon on February 19. Barely a month before Tough Mudder, she still couldn’t do one pull-up. RFYL: Randy Cavadini is our man-on-the-street. I met, or rather I overheard Randy talking in the Sole Sports running store in Glendale about a week after Tough Mudder. He was holding forth to a small group about his experience with Tough Mudder. He was so candid and upbeat I couldn’t help but be drawn in. When he slowed down enough, I gave him my standard pitch, “Hi you don’t know me but I do a running blog that not a lot of people read and I’m doing a piece on the Tough Mudder and you obviously aren’t from around here so would you be interested in doing an interview?” How could he resist? RFYL What made you want to do the Tough Mudder? Originally I wasn’t going to when I first heard about it. I thought that there was no way I was going to be ready in time. Because it seemed so challenging that I decided to start doing endurance events back awhile ago because I’d had a bad test for cancer. So I didn’t know if I had cancer or not and that’s when I decided to start living my life. I though Training for the Mudder seemed seemed like a good way to start my new life. I still wasn’t sure when my police officer friend showed me the sight, no way I could get ready in time, then I thought why not? Why can’t I get ready in time? Only took four months. 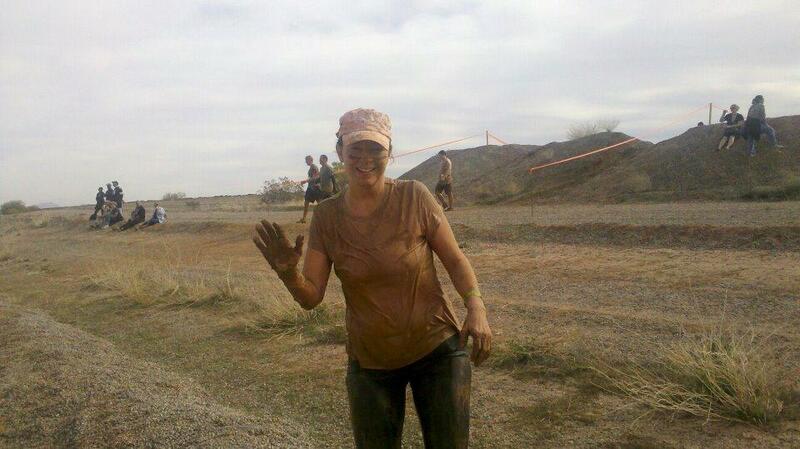 Sharon: I actually did not want to do tough Mudder to begin with. An acquaintance at work (who I might add is at least 12 years younger than me) asked if I would like to do it with her. I originally said no after looking at it online and not really wanting to have anything to do with the ice or other difficult obstacles. At one of our Loss Prevention department meetings, she brings it up again. Our department is about 90% male and we all tend to be a bit competitive. Anyway, one of the supervisors who likes to instigate things asks me if I’m too old to do it (Tough Mudder) Of course I take that as a challenge and that night did my registration. Just looked like a really unique challenge. I had done shorter mud runs in the past, but this one was appealing because the distance would present a real challenge (12.5 miles), and the obstacles looked to be legitimately difficult. RFYL How hard was the course to complete? Honestly for the first ten miles I thought, “Is this what I was worried about?” For the first ten miles I was fine. It’s nothing I haven’t done in the Marine Corps or when I was a kid growing up and climbing trees. But once my energy level dropped, that’s when it got very, very challenging and I started to question whether I could complete it (Mudder course) in its entirety and not skip anything That’s when I started to feel the strength in my body starting to wane. The course was difficult, but not nearly as hard as I had made it out to be in my mind. We maintained a fairly casual running pace in between obstacles, so actually completing the course was never really an issue. But it’s certainly a very challenging race. Mud runs like this are unique in that it’s difficult to find a nice “zone” because of the way that the obstacles break up your cardio. Not like a traditional race where you’re just running. RFYL Which of the obstacle courses was the hardest? There were three. The walls of course, those were hideous and left me completely black and blue. The Mountain of Mud, King of the Mudslide Mountain, whatever was nearly impossible. Then the half pike was challenging. I was already tired, my upper body strength was almost completely gone, and there is no way you can get up that thing easily because the material they use is already covered with mud, and it’s already a slick material. You can’t dig your toes in or anything. I think the hardest was the monkey bars, just because you really couldn’t hop on the bars by that point. Your gloves were muddy and wet, and the bars themselves turned. Bottom line, I made two rungs, fell and waded across. Mentally – the “Arctic Enema” (ice bath). You almost enter a brief state of shock submerging yourself in freezing cold water. Literally takes your breath away. Physically – I’d have to say the 12 foot high “Berlin Walls” just because it was the one obstacle that I would have had a hard time completing without the help of my fellow “Mudders”. I definitely needed a little boost. RFYL How did you react to the ceremonial type start? I appreciated it. It was very motivating. I think the ceremony was more about selling the idea. You know, a hard event. Telling you that nothing you’ve ever done is this challenging and going to the gym is not this challenging. And I was really worried. I was thinking can I do it, am I ready? And being alone that makes it a bit difference. But it (ceremony)was great, motivation. a lot of camaraderie and teamwork. I enjoyed the ceremonial type start. It got you hyped up and excited to go, and also brought to light the real reason we were all there. To help each other and support our true heroes. The Wounded Warriors. Loved it. Really got me fired up. The emcee did a great job – was both funny and motivating. I was an Army Brat growing up (my father is a 30 vet), so the pro-military theme is something that always hits home with me. Couldn’t have been a more fitting charity beneficiary than the Wounded Warrior Project. RFYL How did it feel crossing the finish line? I had cut my eye around mile11 on King of the Mountain. Someone had kicked mud in my eye, my right eye, my good eye and I can barely see out of my left eye. So I ran for the last mile and a half with mud in my eyes. I tried to pour water in my eye to get the mud out but there was gravel in there also. So more pain when the gravel cut my eye. But nothing was going to stand in my way. I set a goal, I did my job, and now it was time to go to the first aide station and take care of my eye. It didn’t feel good until after I dealt with my eye and knew that I had completed it. That’s when it hit me. Ok, I did it, I did a good job. It felt amazing crossing the finish line, knowing you did every obstacle on the course and made it to the end. Amazing. You have that overwhelming sense of accomplishment that you get when you finish any race, but this is unique in that you can’t wait to hit the shower station and get cleaned up. After 2 ½ hours of running soaking wet and covered in mud, you’re really looking forward to a change of clothes. RFYL Did you run alone or with a group? I ran alone. I was trying to get a group of marines to go and they all backed out on me for one reason or another. So I ran alone this year. It was harder because there was nobody to watch my back. If I fell coming off those walls or I fell with bail-jumping. That’s where you are jumping from bail to bail and there’s quite a bit of distance between the bails, then you’re pretty high up. If I fell and broke my ankle there was no one there for me, there was no one at the walls for me so I had to ask other runners to for help. I preferred a group even though many people throughout the course would help you, there really was no way for a short person to get over those 15 foot walls on your own. The group I ran with was basically just a group pf people who wanted to try something different and push our personal comfort zones a bit. None of us had done it before and weren’t really sure what we had gotten ourselves into. But one common goal. We would all finish. RFYL What sort of support system did you have going into the race? A friend drove me to the race. She also took me to the aide station. She was so impressed she is going to do it herself next year. I think I had a good support system within our gym group. Also from my parents and husband who all thought maybe I was a bit nuts. Not much. I trained by myself. My brother and I discussed various aspects of our approach leading up to the race, however, so I felt that I had a good plan going in. It took four months to get ready for the Tough Mudder. I was diligent about my strength and agility training and my running. I didn’t do such a good job with my nutrition. In fact I skipped my nutrition which I won’t be able to do for Ironman. Training was a combination of crossfit type activities as well hiking, running endurance type training. The running portion of my training was similar to training for a half marathon. Roughly – between 15 and 25 miles a week, with a long 10 to 12 miler every other weekend. I do a fair amount of weight training as it is, so I really didn’t modify anything for the physical, upper-body portion. Lots of push-ups and pull-ups. RFYL Do you think you were mentally prepared for this event? Yes but don’t get me wrong I would have liked to have trained with a team. I was ready, but mostly I would say I was ready because of my military experience. If I’d never had that I think I’d still been nervous. But the day of the event I was calm, I was ready, I was focused. I knew I could do it and I knew I was going to do it. Nothing was going to stop me. I think I was too mentally prepared. I think I should have shut down the mental over-reacting. But then again it helped me to motivate for the physical preparation. You don’t truly know what you’re up against until you’re out on the course, so there’s a great deal of uncertainty leading up to the start. You always know how you’re going to feel during a typical run, but anticipating the difficulty of the obstacles is a huge “x-factor” in how you approach this race mentally. RFYL Do you think you were physically prepared for this event? I trained six days a week. I started doing doubles about two months before the event. So in addition to doing six days a week I was doing three extra workouts per week. When you come down off those walls no one’s going to catch you. Unless you’re ten feet tall you’re gonna drop. That’s where you need the extra training. You always wish you were more prepared, and I could have trained alot harder (if I had more off time) but I’m glad I had trained with this event in mind and had a good 3 months to train with our group. I do. Although the one thing that’s tough to physically prepare for during training is the level of discomfort that you experience by being wet and muddy for, essentially, the entire race. The very first obstacle has you crawl through wet mud, and the second has you completely submerged in icy water, so you’re dirty, cold, and wet from head to toe not even 10 minutes in to the race. And now you have to run what is basically a half-marathon in that physical condition. Your shoes are wet and become filled with mud, and it can be a little miserable. The discomfort was one of the more difficult aspects of the race, physically. RFYL Did you feel joy or elation during any parts of the run? I was really happy to have gotten up on the half-pike. I mean I was really happy to be up there. Now, I didn’t do it alone. No I don’t know the two guys who helped me and I mean they were total sweethearts. They didn’t grab anything other than legs or arms and what I can tell from my friends that was a challenge for them. For me I felt joy at the end. When I received my headband! Knowing I finished. I truly had a blast throughout the entire race (except maybe the ice bath…). RFYL Did you experience fear at any time during the run? Oh yeah. Oh yeah. When I got off at the top of that Platform- thinking about jumping down into a big pool of cold water and then you have to swim to the other side. Once I got to the top, there was somebody who had just jumped so I was looking down, then all of a sudden I just felt my whole body go into shock. If the safety guy at the top, the guy who checks to see if it’s clear before he tells you to go, hadn’t reminded me of a similar situation in the Marine Corpse I don’t know if I could have jumped. I started to get Vertigo and I just got sick all over. But just like in the Marines when I heard the order to go, I didn’t think about it, I just jumped. Let’s say I’m not going sky diving any time soon. I think the only fear was fear of the unknown at the start. After you got going you just kept moving. Once you saw the obstacles it wasn’t so bad. No, not really. Although I think I can speak for my brother and say that he overcame one of his biggest fears over the course of the race. He has a bit of a fear of heights, and straddling a 12 foot wall or jumping off of a 15 foot platform into a pool of water aren’t really things that he enjoys in his free time. But he conquered each obstacle, and was deservedly proud of himself for doing so. No, I was well prepared for this. Boot camp will always trump the majority of competitions. Course now, training for the Ironman will be challenging. I wouldn’t say the most amazing but it’s got to be closest to the most fun and rewarding experience. I would say it’s definitely up near the top of my racing/athletic experience. RFYL What did you learn about yourself during and after the race? No, I didn’ learn anything new. I was reminded of something I had learned a long time ago. That once I set my mind to something I will be able to complete it. I’ll find a way to achieve my goal. One way or another I’ll get through it. There was no way I was going to quit, there was no way I was going to stop. So it just reminded me of the way I was in the past, who I was in the Marine Corps. I learned a lot of things you really can do if you just stop thinking about it and jump! I also learned just how important a team is (I knew this before, too. )You can accomplish so much more with team support and it’s just so much more fun to see your teammates suceed as well. That I can genuinely enjoy a race that is untimed and non-competitive from a racing standpoint. RFYL Has the event changed you in any way? Yes. I’ve never been one for competition. I’ve always thought that people who did that were extremists. It was never something that I aspired to do. Nor did I think that I could do it. I didn’t know what it took so I never went after it. Now I see it differently. Now I feel like this is what I should have been doing the whole time. So it makes me hungry for more. I’m enjoying it. I’m loving it. This is the happiest I’ve ever been in my life. I know I can jump into a dumpster of ice water and make it out the other side without freezing to Death!!! I wouldn’t necessarily say that it was a life changing experience, but it was definitely a lot of fun and an amazing athletic experience. And again – it showed me that I can genuinely enjoy an event that isn’t considered competitive from a results standpoint. 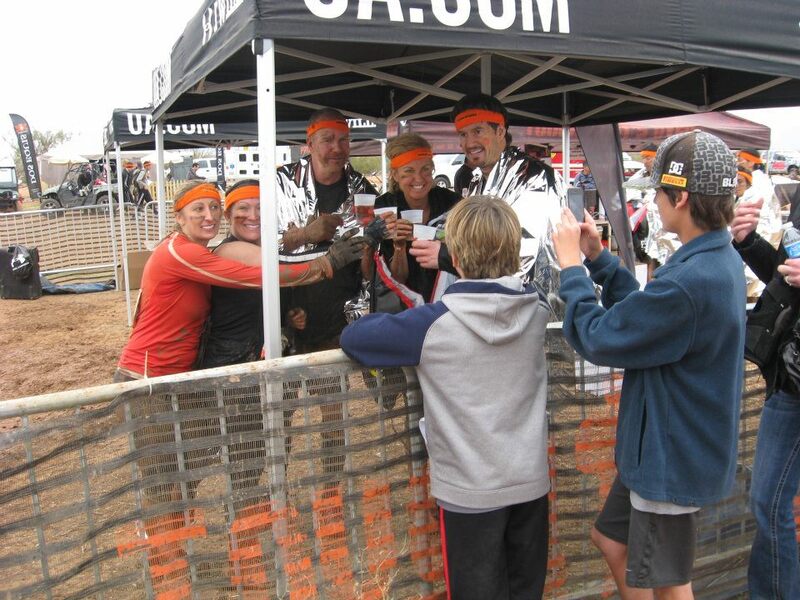 RFYL Do you think events like Tough Mudder make you a better person? The lifestyle I chose four months before Mudder has completely changed my outlook on life. Through this event and the training I’m still doing, I feel totally different about aging. I feel more alive. I feel healthier and stronger. Before I started training I felt old. Now I feel my age is what I make it. I will be a better person because I will be a stronger person. I think so. 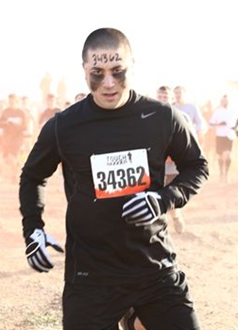 When I first looked at Tough Mudder I thought, “I can’t do that.” Now I know I can! I think it helps you realize all types of goals not just fitness, are within reach. You just have to want it. I think all athletic accomplishments make you a better person. RFYL What was your favorite part of the event? Favorite part of the event. I’m sorry there was no favorite part of the event (she laughed) No, once I was finished, cleaned up and in my regular clothes–I guess that was my favorite part only because when I went into this to me it was work, work I chose and work I love but I went there to do a job. I liked the huge turnout and the fact that it supported the Wounded Warrior project. I try and pick events that support something I believe is important. The uniqueness of the race. You really feel like you’ve done something exclusive. RFYL What was your least favorite part of the event? Not having as much as I would have liked to. Is it fun to be electrocuted. No I don’t think so. Is it fun to jump into freezing cold water and then swim underneath the water to the other side of the tank? No, uh uh. And is it fun to pull yourself up on a twelve foot wall and let yourself down on the other side. And yet people behind me were having fun. People were laughing around me because they were in groups and with teams. Next time I will run with a team and have more fun. On the second day it seemed maybe the preparation wasn’t as good. Some of the people (volunteers) at the aid stations were complaining about just being dropped off and not given any breaks or anything. I also didn’t see the Officials they talked about being on each obstacle to ensure no one continued that was unable to physically complete an obstacle. RFYL Would you encourage others to do a Tough Mudder? Yes and no. Here’s what happened to me. Somebody was giving me a hand up, you know sort of toss me up the wall and I flew backwards and landed flat on my back. Now I could have broken something, luckily I didn’t but no, it’s not for everyone. I would never advise just anyone to do this. If you’ve never done a mud run before, it’s probably best to start out with one that’s a little less daunting, like the Warrior Dash, which is typically 3 to 4 miles and the obstacles are less difficult. Of course. I think it’s a great way to get out there and do something different from the average day- to- day grind. It’s also good to show yourself you can do anything if you’re willing to push yourself. RFYL Would you do it again? Oh Yeah, I’ve already started planning for next year, and I’m going to run with either a partner or a team. I have a friend who actually came out to watch me run and she was the one who took me home when I couldn’t see. And it was a good thing she was there to help me. Now she wants to do it as well. I am doing it next year! Absolutely!!! Can’t wait til next year. In reference to the opening quote by William James, I think our trio of Mudder athletes (Victoria, Sharon, and Randy) have gone “beyond the very extreme of fatigue and distress” and managed to “push through the obstruction”. About the opening Question, Has the naturally competitive nature of running began to fade in favor of the desire to make a contribution to ones fellow man? : I think the event and the participants in this article have answered with a resounding yes! I think it fitting that one of our mudders have the final say. I think in a nutshell the pledge means it’s not all about winning. It’s about what you can learn about others and in turn yourself while challenging yourself to do something difficult. Like they said before the start, you could be on the couch right now, but you’re not. We all need each other to get through, whether it be a tough mudder, a tough run,or just life. It’s all more rewarding when you can reach out to someone and share in the Finish together.